Field tested to meet the strictest quality standards, the 2nd generation Ridgeline rifle scopes are built to measure up to the toughest performance standards. The Ridgeline series is newly designed with the latest optical technology, and feature external locking windage and elevation turrets for quick and easy adjustments. 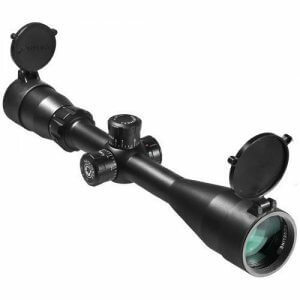 Ridgeline rifle scopes utilize a P4 sniper reticle, fully multi-coated optics and true one-piece tube construction. Two of the four models feature a center lit green, red and blue P4 illuminated Sniper reticle for low light targeting. Ridgeline scopes also feature Barska's innovative Accu-Lock system, which utilizes a coil spring positioned within the scope to securely lock the inner tube. This system allows the scope to stay locked dead-on to the target shot after shot with larger calibers. Serious hunters can truly count on the Ridgeline scopes to provide the brightest and sharpest image, even in low lighting conditions. The riflescope's 1 inch main tube features a shockproof high impact rated design to withstand repeated abuse of high caliber recoil, in the most rugged shooting conditions. Ridgeline scopes include lens covers, flip-up scope caps and are backed by Barska's Limited Lifetime Warranty.